If you’ve been reading my blog for a while, you might remember that my sister set up her own Letterpress card business a year or so ago. Anyway, it got me thinking how nice it is to receive (and send) really special, unique, original, handmade cards. 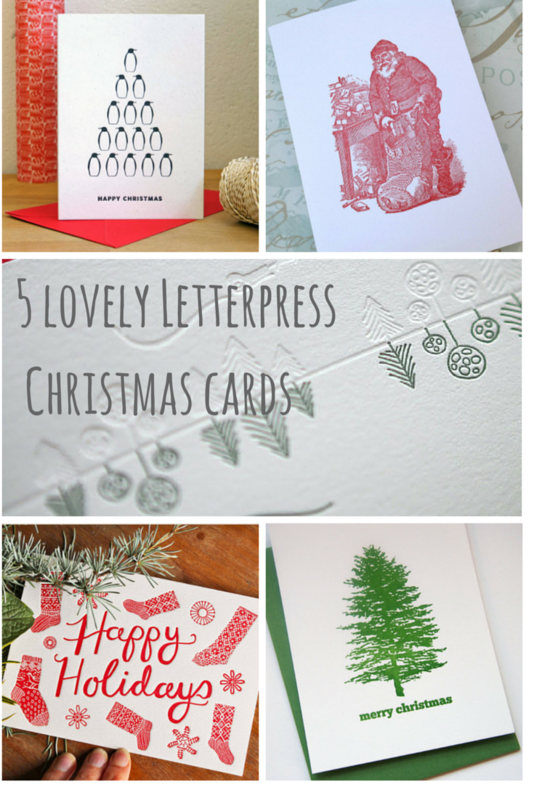 So I’ve done a little research and come up with five of my favourite Letterpress Christmas cards, and here they are, my lovely readers, just for you. I’m a big fan of supporting independent makers, so this year I’m doing my best to avoid Amazon and to shop, instead with the likes of Etsy, Folksy, Not on the High Street, et al. And the cards are the perfect place to start, no?! Of course, sis must have number one spot. She’s got a great selection of cards (and wedding invitations if you’re getting hitched and feeling classy! ), but this amazing penguin tree is my personal favourite. Available from Not on the High Street. I love trees, you know that, right? I’d put a tree on every card if I could, so this Christmas one is hugely appealing. It doesn’t get more jolly than red stockings and snowflakes. I’m a sucker for the red-and-white Christmas colour combo (brings out the green of the tree, y’know) so this is close to my ideal card for the mantelpiece. What’s that, you say? I’m ever predictable? Well, yes, I know, but I just can’t resist a good old vintage image at any time of year and at Christmas those old fashioned pictures just call to me even more strongly. This wonderful Father Christmas is from Rococo Rose made from a vintage engraving. Some beautiful choices, I’m a big fan of small independent makers. There are some really amazing things out there, and a lot of incredibly talented people.